The protease family cathepsin has been found to play a part in bone turnover, and drug investigators are trying to find ways to inhibit these materials in the body. Integrins on the surfaces of bone cells mediate attachment between the osteoclasts and other tissues. If drugs can be found that latch onto these inhibitors, they could be effective in slowing bone turnover. The biochemical pathway of osteoclastic hydrogen ion transport is also a potential target for pharmaceutical investigators. One-time suggestions that statin drugs (most commonly used for cholesterol) might help reduce the risk of bone fractures have been largely dismissed after the results of the comprehensive JUPITER study found no statistically significant improvement. There have been tests with bone substitute implants in rats – tests where they found suggestions that simvastatin could help bone heal after the insertion of titanium implants. However, this is scientific investigation at present and a long way from clinical use in humans. Scientists are investigating the the Wnt/beta-catenin biochemical pathway which is instrumental in formation of mineralized bone by regulating osteoblast proliferation and differentiation. (We don’t fully understand the biochemistry here; we are just reporting). It was reported in 2007 that "specific pharmacological targets to influence bone formation have been identified in this pathway". but there haven’t been any drugs brought to market yet. This pathway is involved in many bodily processes (it’s roughly related to stem cell differentiation) so the finding the right pathway to help with osteoporosis without screwing something else up is not easy. The biochemical sclerostin is known to limit expression of this pathway. Sclerostin is a Wnt antagonist and its action is limited to osteocytes. Mutations in the gene for sclerostin are responsible for skeletal disorders such as sclerosteosis and van Buchem syndrome.. Experiments in animals show that if we can reduce sclerostin in the bone tissue, more bone mineralization occurs. Echinacoside is a plant derivative that has attracted attention as an antioxidant. Chinese scientists tested it in rats as a treatment for thinning bones. It passed the initial test as being safe and there was a suggestion of efficacy. The ratio of OPG/RANKL increased in the rats' blood when they took echinacoside. More work is needed in the area. Pharmaceutical industry experts expect a move away from anti-resorptive drugs for osteoporosis treatment and toward anabolic agents like SARMs. New SERMs, including bazedoxifene and lasofoxifene (which are both sold in Europe, but not the US) are under investigation. These drugs may be useful for prevention and/or treatment of osteoporosis as well as addressing other age-related issues of post menopausal women. The biochemical pathways Neuropeptide Y (NPY) is involved in are under investigation and may someday yield drug therapies. Biochemical regulators of osteogenesis including the transforming growth factor betas (TGF-betas), insulin-like growth factors (IGFs), and bone morphogenetic proteins (BMPs) — these, too, are under investigation for possible avenues to new therapies. There is also interest in human growth hormone as a panacea for aging in general, including declining bone density, although there are problems with hormone supplements. Chemists have recently modified parathyroid hormone so that it doesn’t break down as fast, at least in laboratory animals. Peptides break down in the body, and by modifying the “backbone” of the molecule so that concentrations remain higher at the cellular level over a period of time the effectiveness of the drug may increase. Pharmaceutical giant Eli Lilly is pursuing development of a skin path that would apply microinjections of parathyroid hormone. The idea is that would be a method of delivering the hormone that is more friendly than Forteo, which must be kept in a refrigerator and injected with a conventional needle. The new product reportedly uses a formuationof parathyroid hormone that is stable at room temperature. WNT signaling drugs are usually thought of as cancer medications, but some are under investigation for bone health. The Wnt/LRP5 pathway is part of the bone-forming physiology. The body produces WNTs which are glycoproteins that are involved with a host of functions. These include the initiation of bone growth. WNTs can regulate morphogenesis of bone. Scientists see potential pharmacological targets on this pathway that they may be able to exploit to produce new osteoporosis treatments. Melatonin is a hormone in the body and has antioxidant properties. It is widely available over-the-counter in the United States and many people take it to sleep. Suggestions that it can interfere with osteoclasts and result in higher bone density have led to the idea that melatonin could be used to treat osteoporosis. Biochemically, it works by "suppressing through down regulation of the RANK-L". Research in this area is proceeding. Chondroitin is a widely sold supplement that some people use for joint problems. Its use is not accepted by the official medical community but some doctors will give it an unofficial blessing. Chondroitin sulfate is often sold in conjunction with glucosamine. The combination is used for any joint or knee pain, which may or may not have a connection to osteoporosis. Impaired bone formation can be addressed through hormone supplementation. While it was known from animal studies that giving injections of parathyroid hormone could increase bone mass, it is only in the last decade that with the development and use of teriparatide that this has become an effective therapy in humans [LINK to teriparatide. Teriparatide is synthetic parathyroid hormone. Strontium ranelate is both antiresoptive and anabolic. It has been called "dual action" because it both slows the degradation of bony mineral and it promotes formation of new mineralization. One concern here is that the strontium becomes part of the bone mineral. This does not have known negative effects on the body, but it does throw off the results of the DXA scans. A decade ago there was scieitifc work going on here, and good results were leading to researchers wriring thay strontium ranelate could make a good treatment option. After several years on the market, concerns about increased risk of heart attacks led the manufacturer to relabel it for use only in high-risk patients. The US FDA never approved strontium ranelate for osteoporosis treatment. Another strontium preparation – strontium citrate – is sold over the counter in the US. We could find no scientific evidence that it helps reduce risk of bone fracture. Strontium is on the same column of the periodic chart as calcium, so some assume it is good for you. This is why strontium is likely to become part of the bone. Why people can’t just consume calcium instead is not explained by promoters of this supplement. Sometimes doctors address brittle or fragmented bones by putting something in their place. Implants can be either real human bone grafts or a synthetic substitute. Grafts are additions of bone from elsewhere in the patient’s body (an autograft) or from another person (allograft). When people donate their organs, this donation can include bones which go into storage - bone banks. 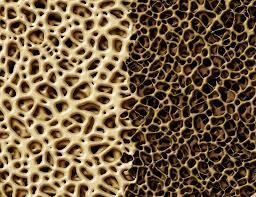 Tissue in bone banks is often treated with bisphosphonates (which have extremely long half lifes.) When the bone is used for grafts, this previous treatment may not be optimal for the receiving patient. Repair of bone fracture includes use of screws, pins, or plates either temporarily or permanently. Grafts are sometimes employed to encourage the split bone to join in one big bone. Foams, which are colloids of gas (air) and a metal such as steel or a nickel alloy, are under development for orthopedic implants. Metal foams can be produced with powdered metallurgy, which is a mature technology using polyurethane that later vaporizes. The foams of interest by orthopedists are only one-third the density of solid steel and can absorb substantially more energy than plain metal implants. Titanium foams are under investigation by German scientists. A Titanium-Aluminum-Vanadium alloy . The results suggest that bone tissue grows into the foam, further enhancing stability of the implant. Titanium foams are under investigation by German scientists. A Titanium-Aluminum-Vanadium alloy appears to work best. http://www.ipmd.net/articles/000910.html The results suggest that bone tissue grows into the foam, further enhancing stability of the implant. This synthetic implant material is designed to have modulus of elasticity similar to that of natural bone. That’s one reason forms are under investigation: plain titanium implants can be substantially stiffer than bone. Selective Estrogen Receptor Modulators (SERMs) are chemical compounds that act on the estrogen receptors in the body. More.